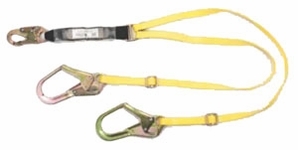 When free-fall distance can exceed two feet, use a lightweight, low-profile MSA 10072475 Workman� Energy-Absorbing Lanyard. The energy absorber not only limits force on the body in a fall, but also on the anchor location. The shock absorber includes a clear, durable protective cover over the labels to increase service life and allow for easy inspection.